For more information on LPA advertising, please click LPA Advertising FAQs, or for long term banner ads, please contact us: advertising@thelpa.com or by calling 516-483-4785 or toll free 1-877-9theLPA or 1-877-984-3572. Would you like to exchange your website link with The LPA? Landlord resources include a unique arsenal of free and essential landlord forms, landlord tenant laws, credit reports, advice. Tons of free landlord tips and information. Report tenants to the deadbeat database / national tenant rating bureau. 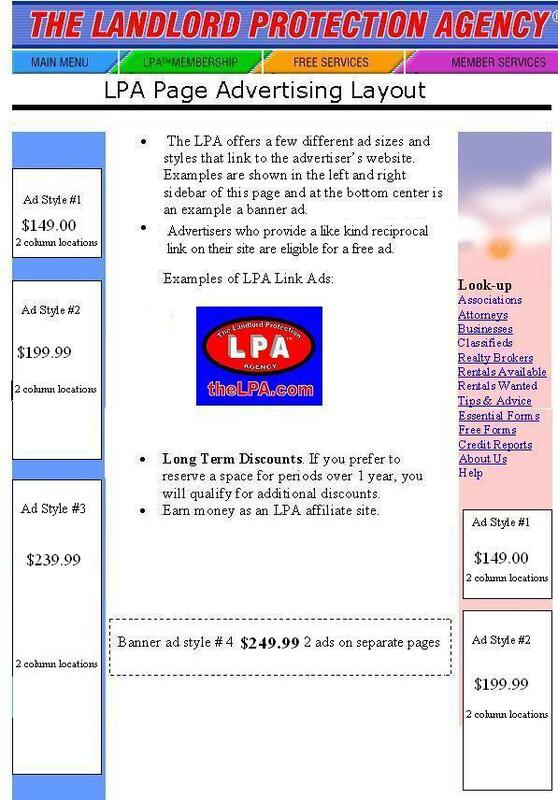 Below is a typical page layout with the locations, sizes and prices of ad-links. You can order & pay for banner ad(s) online with the links below. We will promptly credit a refund for any ads that are not approved. Please allow 48 hours for your ad to be posted. Please call toll free 1-877-984-3572 if you have questions or would like to request any particular pages for your ad..
Ads run for 3 months. Make money as an authorized LPA Affiliate! Earn a 10% commission on all orders placed with The Landlord Protection Agency by customers that you refer to us! You get paid for each order placed through your specially coded internet address for The LPA site! How many landlords do you know? Join The LPA Affiliate Program!